Motors arrived some days ago. Family and work issues have kept me away from the workbench, so I was not able to progress too much. Anyway I was able to make the electric harness to connect the 2 batteries, 4 ESC, Receiver, and a Voltage Indicator. Well here it is finally fully assembled. I did some test runs inside of the workshop and for what I can see now it is not going to work any well (as expected ) This is what it is, trial and error. Really cool project lots of innovative ideas . But any of the electronics sitting outside the wheels are going to take a beating. And will let the truck hang up on the rocks or other stuff mother nature but's in Ur way. Not trying to be overly critical just being realistic. Last edited by Tom G; 06-13-2018 at 09:23 AM. Video of Gosainthan :p running. I crashed just before filming against a wall already broke a part fixed it and made the video. That parts brake is part of the plan as it is printed very weak in order to redesign and improve strength. Maneuverability is great, even that I am not getting full turning radius with this servos. But it does not work any well due not using the correct gears and not appropriate gear ratio. It almost has no power due that. Thank you for the input I have the same feelings. 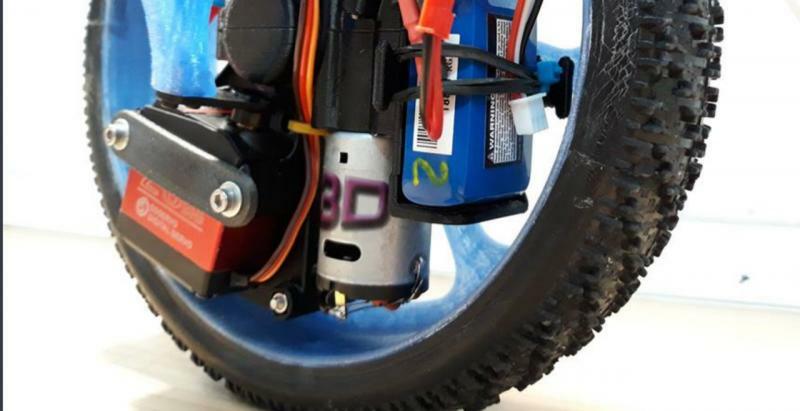 This wheels are around 30mm wide the motor and battery are almost fully covered with the wheel but the servo is quite exposed. And I have plans for next iteration, move the motor, battery and servo more inside the wheel and use wider wheels (around 40mm) and a slider/cover for all parts. The video looks good, for first test run it appears to be a success. Granted redesigning some stuff will improve it, but for a first test I would be happy with what you have already accomplished . The extra 10mm of width for the wheels will help a bunch to protect electronic devices. After several test I have discovered manny flaws of the design. Main issue is lack of power, something that it was on the table even before testing. I printed the parts strong but not ultra strong so they can break easily in order to improve the design latter, and with that I have already discovered a couple of issues, one is a weak point on the axels design and that PETG is not a good material for RC car parts due its viscoelasticity characteristics. After the first test i wasn't any happy at all, I expected a lot of different flaws but not such a big problem with low power It makes that I can not test it on rocks so more issues will arrays when I enter in rocks. I Do wish I had CAD skills. I'm playing with a couple software programs but never seems to be enough time. I will anxiously watch for next updates. Getting into CAD can be very daunting, even more so without any way to visualize your designs (laser cutter, cnc router, 3d printer). Designing things you enjoy helps a lot at the beginning. Try Onshape, the learning curve is fast and easy and it is a fully capable CAM software and it is free for hobbyist. How is the redesign going here? I received the new gears some days ago and I hope to have some spare time by the end of mont or in August. Will redesign he gearboxes for the new gears, and will see. Finally I have took some days off this Christmas and done some improvements on the gearboxes design design. Will post pictures and so in a a few days. BTW, what happened with the pictures??? If they were hosted on photobucket, they w w re pro ably removed because photobucket changed their service to make it so you have to pay to embed photos. All that would show is a non working link but no photo.